World-renowned teacher and bestselling Nightingale-Conant author Joe Vitale opens his complete “attraction arsenal” to YOU. Every secret, strategy, system, and step you need to unleash the most powerful force in the universe in EVERY SINGLE AREA of your life! Don’t just attract some of what you want… attract it ALL! The ULTIMATE “Attraction Arsenal” from Master Teacher Joe Vitale! 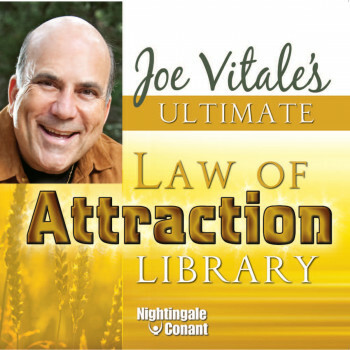 In this unprecedented 12-CD, 20-session collection, world-renowned teacher and bestselling Nightingale-Conant author Joe Vitale opens his complete “attraction arsenal” to YOU. Every secret. Every strategy. Every system. Every step. Everything you need to unleash the most powerful force in the universe in EVERY SINGLE AREA of your life! His goal for this program is to guide you through a complete journey to a life of abundance and fulfillment on every possible level, from the material to the spiritual and everything in between. A journey that will feel as fresh and exciting to his longtime fans and students as it will to those hearing him for the first time. The Law of Attraction is the one force that really can empower you to get anything you need and everything you want. No one on the planet is more qualified to teach you how to control that force than Joe Vitale. And The Ultimate Law of Attraction Library is Joe’s ULTIMATE playbook. Order it today. Then sit back and watch… as astonishing opportunities and unexpected riches appear in EVERY corner of your life.